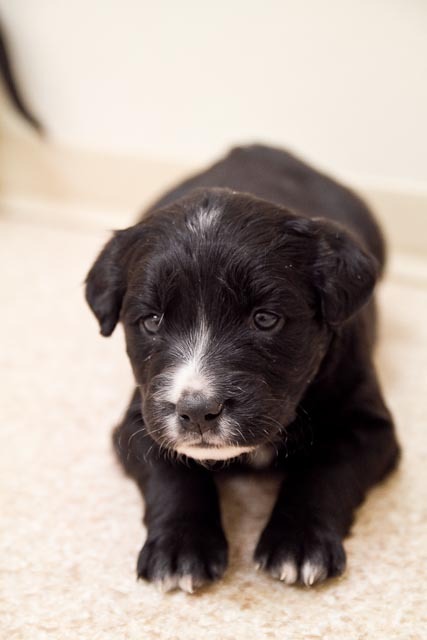 Warning: Do NOT go to the animal shelter if you have puppy fever. These guys were dropped off 5 minutes before I arrived. SO CUTE!!! Can you tell who the super model was? Talk about a mischief maker! 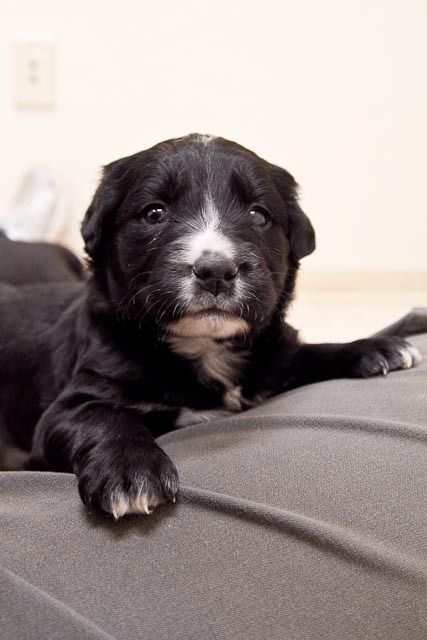 And to top it off, Lily’s puppies are still there too, but I believe they have all been spoken for…. 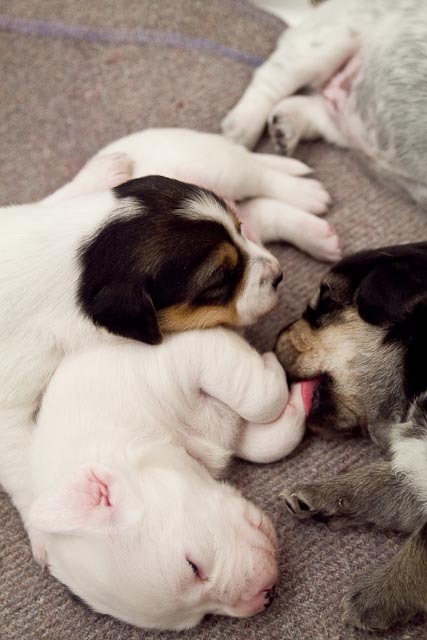 Check out the guy on the right using his sibling’s foot as a soother! 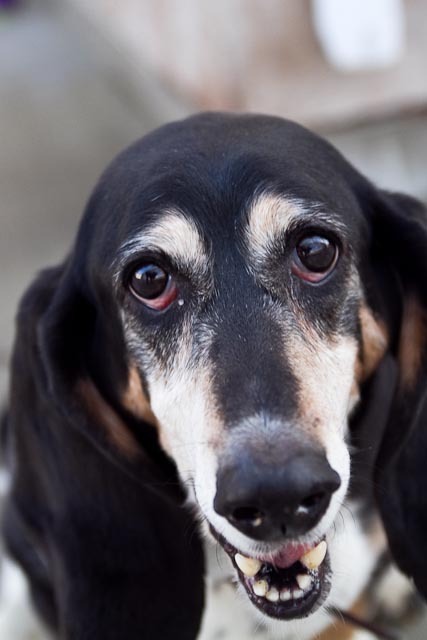 And if that wasn’t enough to push you over the edge, check out this gorgeous Basset Hound. And this handsome mastiff cross was very sweet. 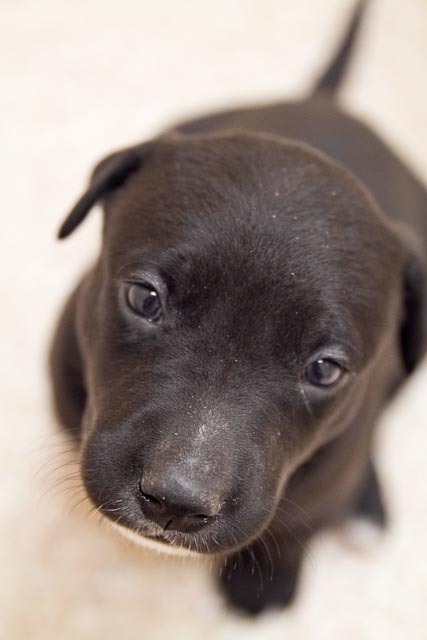 And I think this little girl is available. She was hanging out with the puppies and I don’t know what her story is. 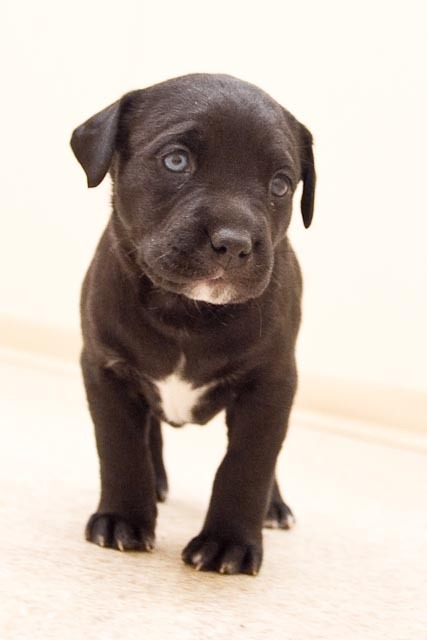 So if you are in the mood to come home with a new little bundle, there are lots available at the Lethbridge Animal Shelter! There are still lots of cats too which I wasn’t able to photograph today because all the available rooms were filled with pups. 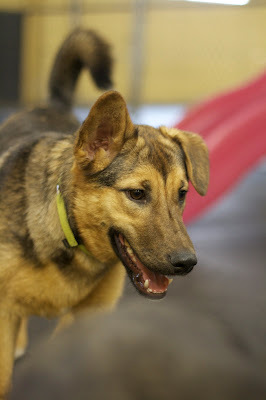 Posted In: Dog Daycare, Photography, Rescue. This week I thought I’d showcase one of the most popular breeds around- Dachshunds! Miniature: Approx. 8 inches (20 cm) tall at the shoulders, 20 inches (50 cm) long, nose to rump and 6 inches (15 cm) wide. Standard: 30-40% larger than the Miniature. 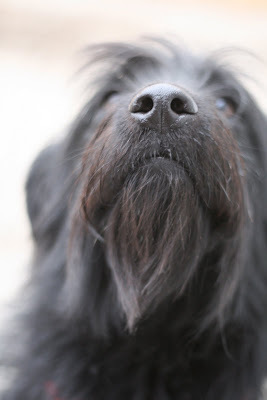 Wirehaired: Slightly higher off the ground than the Smooth and Longhaired. Miniature: The ideal weight is 10 lb (4.5 kg). All types/sizes may be one-coloured, two-coloured, dappled or striped. Dachshunds, also known as Dackels or Teckels, were developed in Germany and used to hunt badger and fox since the Middle Ages. The original Dachshund was the Standard Smooth. 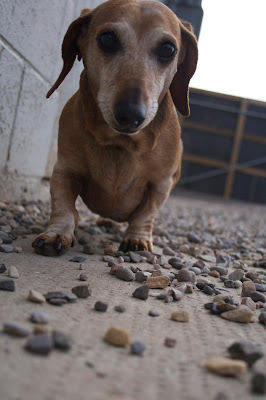 The name “dachshund” means “badger dog” in German. Dachshunds work in packs and are strong and fearless when sent underground to rout out the ferocious badger. These short-legged dogs were well recognised and known as one of the most versatile and useful breeds for hunting both below and above ground. They come in two sizes, and three coat varieties. The Miniature Dachshunds were bred to hunt the rabbits that destroyed farmers’ crops. 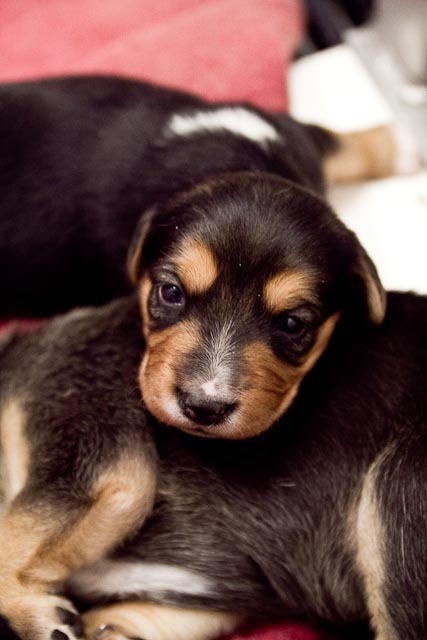 These little dogs must be small enough to slip down rabbit holes and, in their native Germany, they are classifed according to girth, not weight. 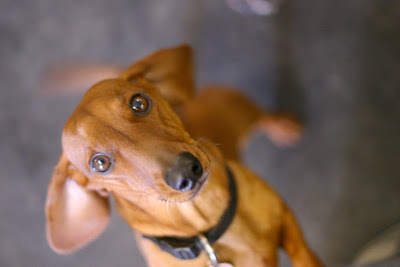 The Dachshund is clever, lively, fearless, persistent and outgoing. 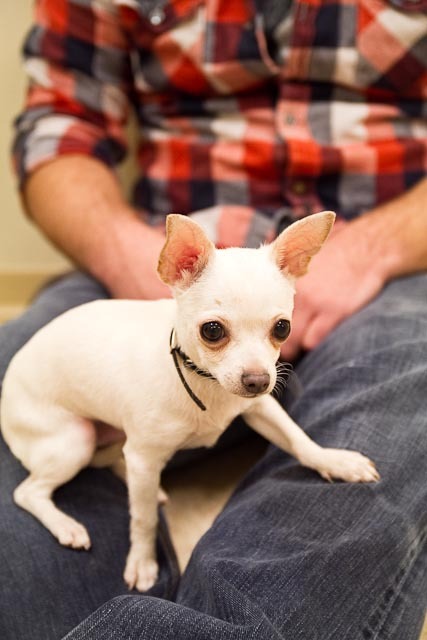 With his fun-filled outlook, he is an affectionate and wonderful family companion. 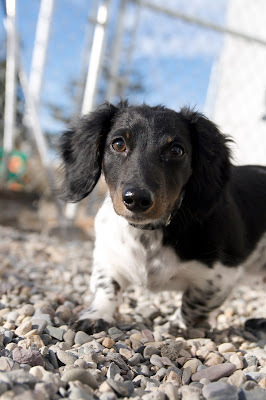 The Dachshund’s lively and active personality make him an ideal participant in several dog sports and activities, such as Obedience, Agility, Tracking, Earth Dog Trials, Field Work, and Hunting. 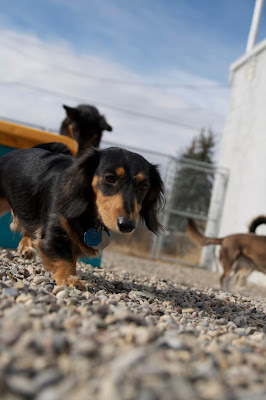 We are lucky enough to have a whole bunch of Dachsies attend daycare. 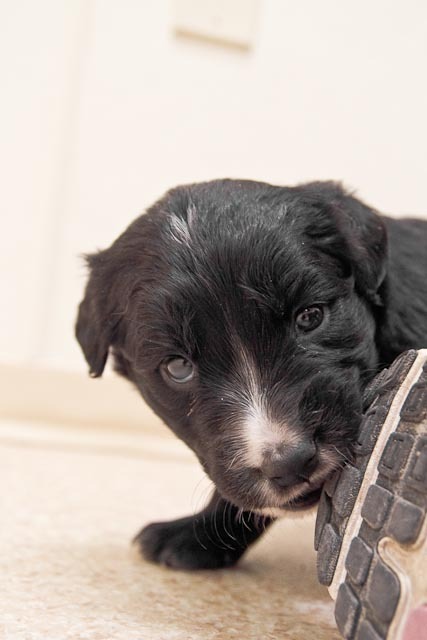 They are great little daycare dogs and are generally quite playful and active. 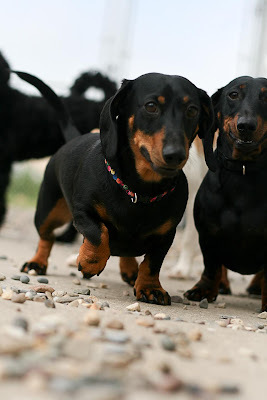 Dachshunds are feisty enough to even play with the big dogs on occasion! The Dachshunds that we have at the daycare range from busy and wild to laid back couch potatoes! And some fall in between. 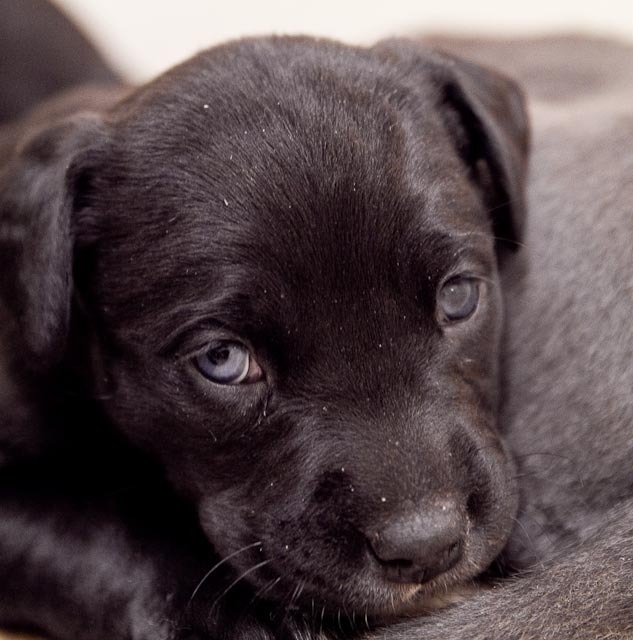 Because of their size and activity level they make great family pets, but it is important to socialise them young with people, dogs and cats so that they remain friendly and outgoing. Also, as with all long, short dogs they are prone to back/disc problems. Keeping a Dachsie thin is the key to a long life! 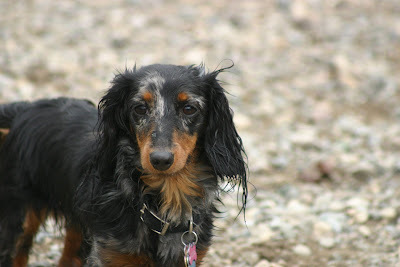 As mentioned in the breed standard above Dachsies come in all coat colors and variety. Here are a just a few that come to daycare. Buddy is a mini longhair too! He is quite unique in his coloring. Pip is an old girl, a red Mini Smooth. She has faded with age, and her face is getting whiter and whiter. These two handsome devils are Max and Otto. They are both Mini Smooths. "Not by the hair on my chinny-chin-chin!" Katie has the most amazing expression. 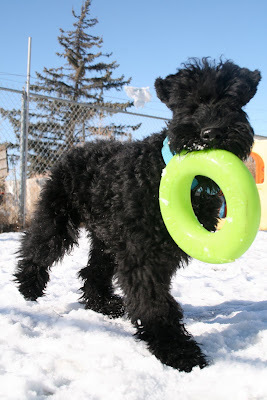 Malachai is a Kerry Blue Terrier puppy. He is new at daycare but has had no problems making friends! We are excited to offer a variety of new classes! Check out the list below and let us know if you and your dog would be interested in attending! 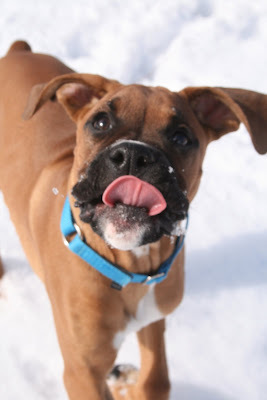 teach your dog the basics including leash manners, how to greet guests, and more! start those puppies young! 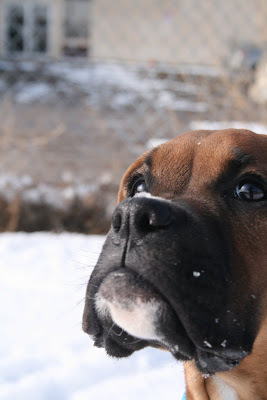 All the basic skills for obedience, as well as typical puppy issues. looking for a more advanced class? 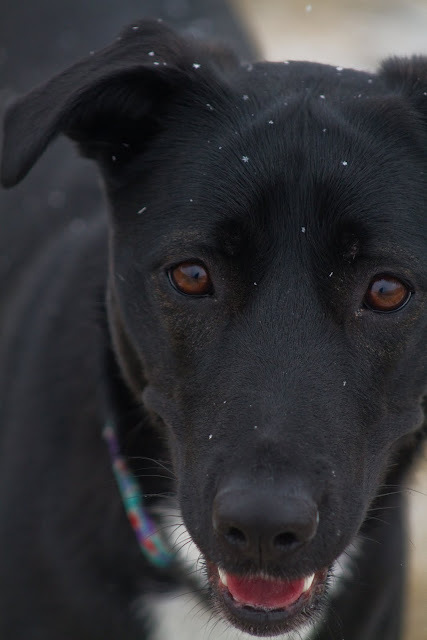 This class is more than the basics and will include off leash obedience, more distractions, hand signals, and fun tricks. looking for something fun to do with your dog? Rally Obedience is great fun for all dogs. 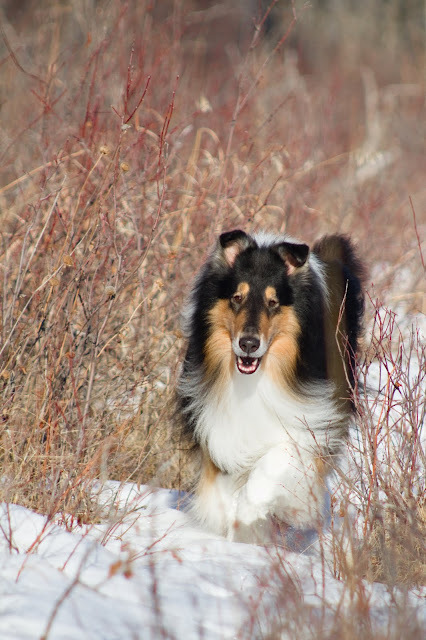 Rally is an obedience challenge and will fine tune your dogs training and improve you and your dogs relationship! a fun class to teach you and your dogs some great tricks. Tricks are a great way to build confidence, and improve your training skills. Classes will only run if there is enough interest. Please email or call to be put on the class list and we’ll contact you as soon as the class is filled. Mind your Manners, and Beyond Basics are set to start Monday, March 8th. There are spots still available in both. For a slight change of pace I thought that it would be fun to showcase a different breed of dog each week. 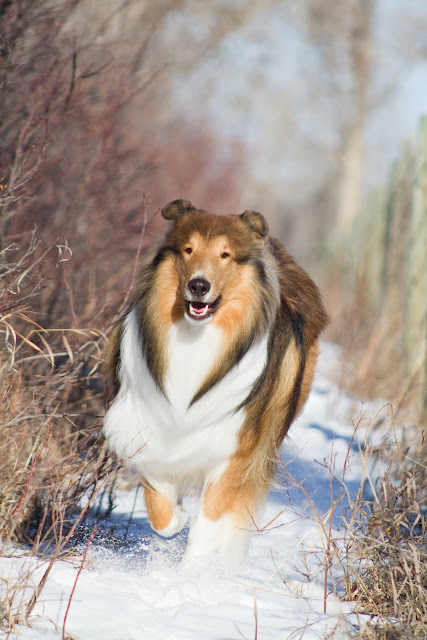 I’ll post photos, breed information and website links to parent breed clubs so people can learn more about new breeds, and the breeds that they know and love. 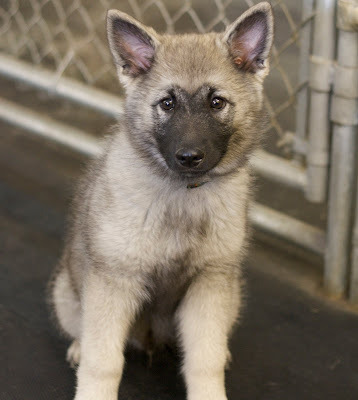 This week I have chosen the Norwegian Elkhound. CKC Recognized / In the HOUND group. The Norwegian Elkhound has been honoured as the dog of Norway. 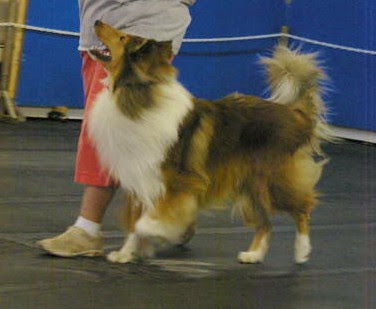 He comes from Spitz-type dogs known in Scandinavia since Viking times and perhaps even earlier. 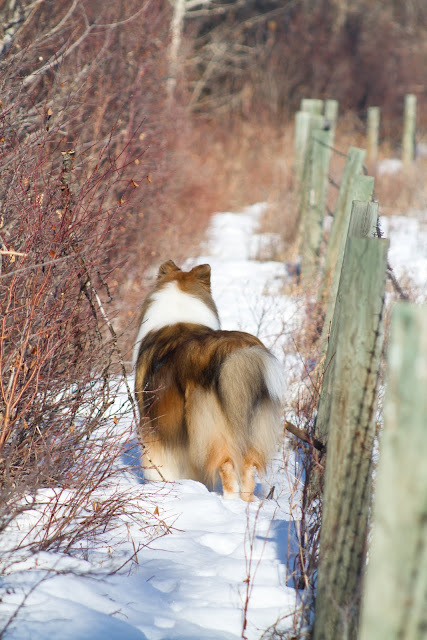 In their homeland, Elkhounds have been used to pull sleds, guard the home and family, do mountain rescue and hunt big game such as moose and bear as well as smaller quarry. 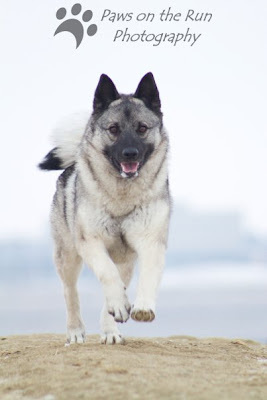 The breed was known as the Elghund, meaning “moose dog,” but it became Elkhound in English. Bold and Energetic, the Elkhound is an excellent family pet and guardian noted for being good with children. 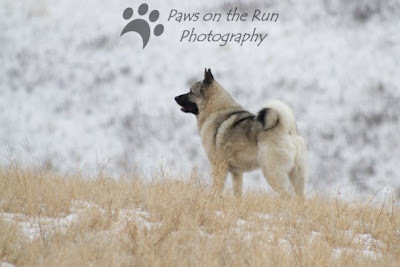 A dog of great endurance and stamina, the Elkhound is relatively tireless and likes having a job to do. He’s a rugged outdoor type that needs plenty of exercise. The coat is thick, rich and hard but smooth-lying. On the head and front of legs, it’s short and even. The Elkhound is grey in colour with black tips to the long, covering hairs. Regular, thorough brushing is the only grooming attention required. 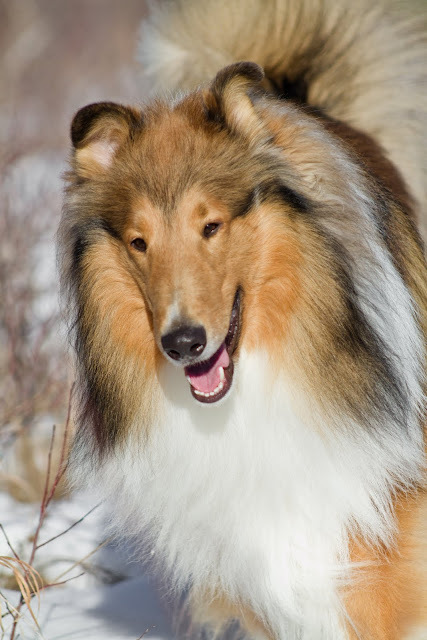 This is a breed that sheds year round, but more so in the spring and fall. 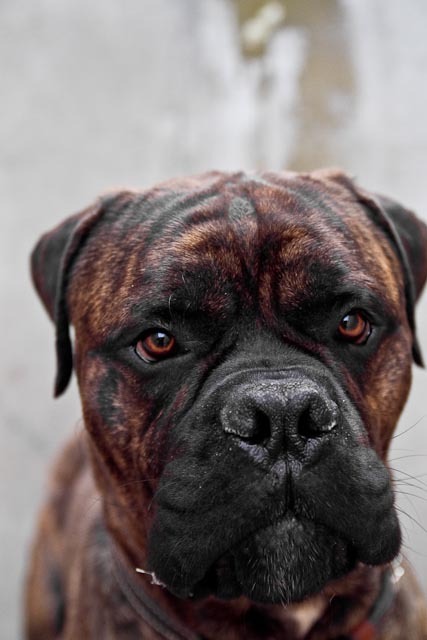 We are lucky to have four of these beautiful dogs attend daycare regularly. They are fantastic players and definitely liven the place up at times. Elkhounds are a happy breed and often have big smiles on their faces. 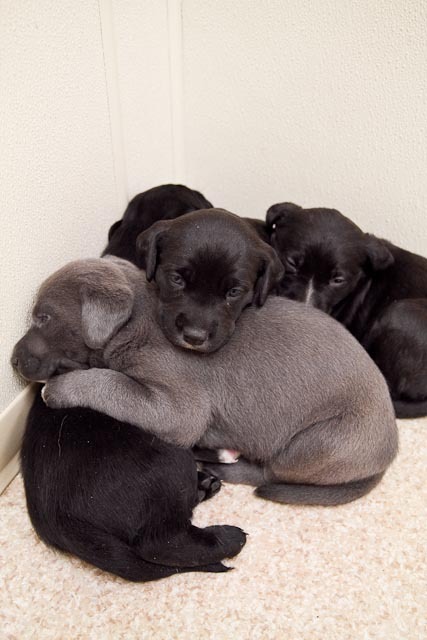 They are a “hound” breed so can be a little independent but for the most part they love people and are very friendly. The trademark of an Elkhound has to be their bark. They like to hear themselves and aren’t afraid to express their opinions! Thankfully they are mostly obedient and want to please you. It makes teaching a “no bark” command doable. The Elkhound is a beautiful breed that can easily capture your heart- they aren’t for everyone though so be sure to do your homework if you are interested in adding one of these beauties to your family! 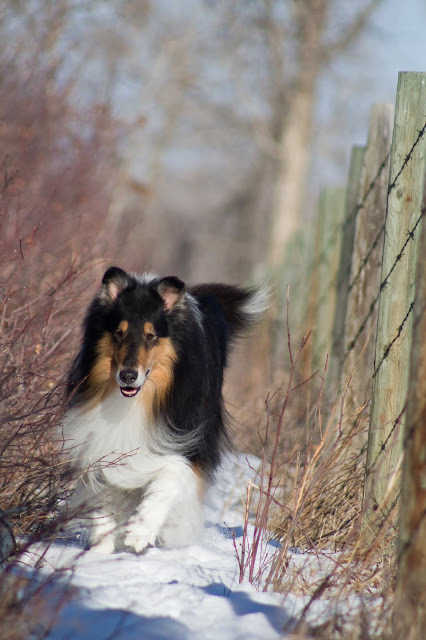 Jo, Kort, Tate and I went out to Fort MacLeod yesterday for some pictures. The off leash park there is great, and usually deserted. I can only ever seem to find game paths to walk on, which is fine if you don’t mind a whole bunch of willows slapping your face with every step. They sure look nice in the background though. We did manage to find some “open” ground next to the fence which made walking easy for a while. As usual, the boys looked gorgeous. Just look at that big white ruff! I always enjoy seeing which pictures Jo will pick as her favourites. They aren’t usually the same ones I pick. I think I am getting better at figuring out what she likes though. We’ll see how close I come this time. Thanks Jo for letting your dogs model for me again. It is always a pleasure! Just a couple of pictures from my dog walk this morning. This top fellow is Gus. 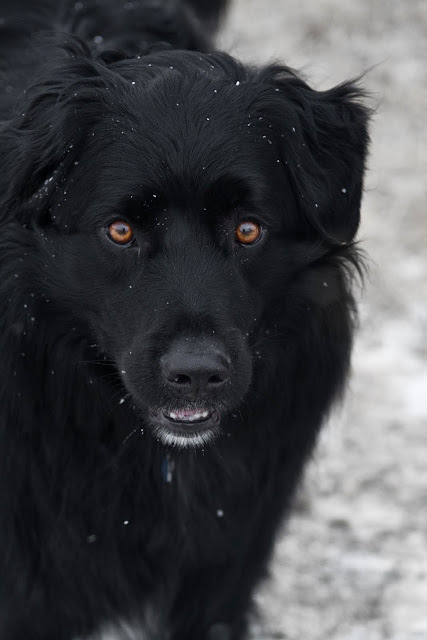 He is a border collie, golden retriever just like Coulee. You’d never guess they were the same mix. And this is Jetta. We are dog sitting her for a few weeks and she has been learning that the camera usually means treats and fun. Don’t you just want to squish him?